A home game in Detroit was the most normal thing about this last week for the Buffalo Bills. They didn’t wear throwbacks honoring their original Lions-inspired uniforms, but Buffalo still looked comfortable sort-of hosting in a different border city. All it took to get a Monday night game was a crippling storm, which was almost as big a disaster as the Jets. In football terms, utterly dominating what is hopefully the season’s most surreal game may not be enough. Wiping their feet on the division’s doormat still only got them to 6 and 5, although turning their wildest schemes into reality made for uncommon entertainment. The cataclysmic prospect of losing to the Jets would’ve made eight feet of snow seem like a relative inconvenience. But this pent-up defensive line and friends were going to have none of it once they got to run around in a space bigger than their living rooms. A thorough triumph was nice for fans who wondered less how the game would go and more where it would go. Changing the schedule that’s been in place for months a few days before a contest went as well as could be hoped. We’ll have to invite Detroit over for wings. I think it’s safe to go ahead and say that less time preparing didn’t affect the Bills. Persevering through such a dramatic climatic challenge is impressive. It’s hard enough to excel while your routine is in place. But just getting to work task when there’s a snow barrier hugging the front door brings normal life to a standstill. Thinking of how you’ll win a football game when your municipality is buried demonstrates a thorough dedication to work. Like many Western New Yorkers, the Bills found that moving snow to the lawn is an easy way to keep in shape during the chilly times. The team missed the crowd more than the precipitation. 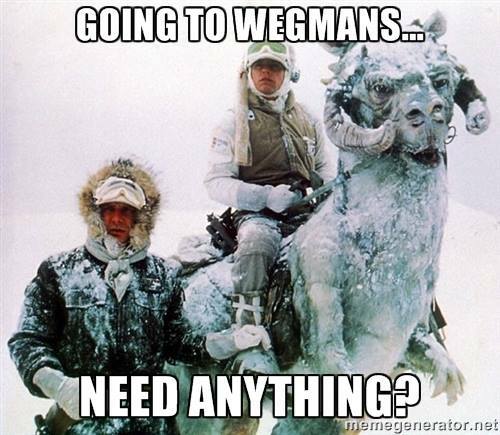 The Bills are stereotypically thought to thrive in Hoth-like conditions. But natives may be projecting their own personalities onto the team. After all, most of those who play for Buffalo aren’t from anywhere nearby. The unfamiliarity with frigidity led to much-needed hilarity while coping with hazardous circumstances. Take Instagram documentation of endless flurries provoking players to lose their minds in rather amusing manners. Boobie Dixon turned cabin fever into a fine rushing performance along with the punt block of the year. The shock many on the roster experienced upon encountering one story of snow is a reminder that pro athletes are usually transplants or transients. Those who adjust to Buffalo’s hardy way of life become our favorites, such as a quarterback who at first fled Pennsylvania to attend college in Miami and initially chose to turn pro in Houston due to fear of the cold. Locals can hopefully show those who come to the area for work in the pro sports industry the virtues of four solid seasons. Sure, it stinks getting one fewer home game. But that’s the least important thing to those recovering after the thaw. Blame the Toronto Curse for only getting to play in Orchard Park seven times this season. Intrepid fans who went to Michigan to watch a New York team play a New Jersey one remind us that it’s the crowd that makes the Ralph an unwelcoming place for football visitors. No opponent should welcome the prospect of facing ticket-holders sick enough to look forward to taunting shivering football visitors. Sunday will hopefully provide a chance to work on tans in the powder. I feel guilty for being in New York City instead of inside Buffalo’s snow fort. Having to see stories about Gang Green on the New York Post’s back page is part of my punishment. Missing the shoveling action is exacerbated by coping with life in Jets land. It’s hard to tell, as I’ve never encountered a less enthusiastic fan base. Maybe there are too many distractions in Gotham, especially when backers have to hop the river into Jersey to cheer for the Mets of the NFL. There are worse things than only having one more win than loss. Snow makes you tough. Taking comfort inside inside after a tricky commute always feels particularly satisfying. Likewise, hot chocolate is the best way to replenish calories burned while liberating the driveway. Even then, a rather severe case of early winter can sometimes be too much, which is why Terry Pegula has even more incentive to build a downtown stadium north of the snow wall. A little less lake effect could help a lot. At the same time, an unprecedented storm shouldn’t drive the Bills indoors. A lid takes away the fun of coping with shivering. Nobody knows better than Buffalo’s attendees that football is exciting whether watching in t-shirts or parkas. Besides, a dome might not have prevented moving the game to Ford Field if the situation outside remained ferocious, as anyone acquainted with the Astrodome rainout can attest. Moving a game was the least inconvenient thing about the storm. Many Western New Yorkers suffered almost superhuman hardships after cold air hit the warm lake. Those who lost far more than a home football game should be foremost on our minds. But perspective doesn’t mean we have to give up enjoying athletic contests. Spectacular moments in every phase provided a satisfying distraction. Manny Lawson scored twice as many points as the Jets, which was just what Erie County needed. We’re used to oscillating seasons of all kinds. Western New York weather fluctuates as much as its football team, so enjoy while it’s nice. This entry was posted in 10 Things I Billieve and tagged #OneBuffalo, Boobie Dixon, Buffalo Bills, Ford Field, Jim Kelly, lake effect, Manny Lawson, New York Jets, Ralph Wilson Stadium, Snow, Terry Pegula by Anthony Bialy. Bookmark the permalink.